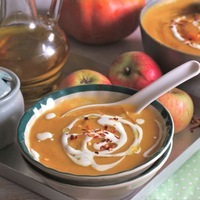 Curried Pumpkin Soup is packed with goodness of pumpkin, carrot and apple flavored with whole spices and a dash of curry powder. For the first time I tried apple in a soup and I really liked the taste, apple added a hint of tartness and sweetness to the flavor profile of the soup, which was complimenting the character of whole spices especially cinnamon. With winter breeze knocking at our door every now and then soups are the best comfort meal for this time of the year. Now add carrot, saute for 4 - 5 minutes followed by pumpkin and apple. While serving finish with tsp of cream, olive oil, sprinkle melon seeds and chili flakes on top. Serve hot.